Chloe's story is told in a dog's perspective by Chloe and her friends. Chloe is a rescue dog and is now 4 years old and living with Canine Addison's Disease. It is written as a children's book, but good for all to support the cause. Our story is short and sweet with photo's of Chloe and her friends, some who are still with us and others who have gone to Doggie Heaven. Our main objective is to spread the word about this rare Canine Disease, which is often Misdiagnosed or delayed diagnosed due to so many symptoms and sometimes can be to late for our loved ones. 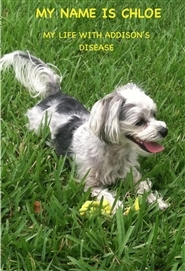 Chloe and her friends thank you in advance for helping us educate people about Canine Addison's Disease.